Auntie Anne’s hasn’t been shy about venturing abroad over the past year, breaking into new markets like Japan and Poland, where first-day sales exceeded expectations by 80 percent. Joining the ranks of Focus Brands late last year—alongside sister brands Cinnabon, Schlotzsky’s, Carvel Ice Cream, and Moe’s Southwest Grill—the pretzel pros boasted record sales of $394 million in 2010. 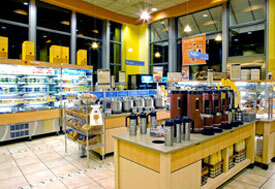 Auntie Anne’s has 1,100 stores and a presence in 44 states and more than 20 countries. Under new president and CEO Frank Paci, McAlister’s systemwide sales exceeded $357 million in 2010 and are projected to reach $385 million this year. Expansion is key for the company, which has plans to develop 80 stores in markets like Virginia, Oklahoma, and Iowa by the end of 2012, in addition to its 305 existing locations. Aiming to speed up service and enhance quality, the company has designed a new store prototype that will launch in Mississippi during Q3. Customers can also look forward to new menu additions, like artisan breads, Black Angus roast beef, and Black Forest ham. Starting the new year off with the introduction of its “Food Mission,” a new restaurant prototype, and expansion overseas, Moe’s Southwest Grill has had a lot on its plate over the last 12 months. Its more than 420 locations pulled in $347 million in U.S. sales in 2010, and the brand introduced new products like the LTO Spicy Trio, which featured Spicy Queso and Jalapeño Sour Cream. 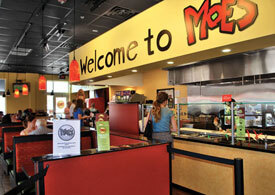 Moe’s plans to open 65 locations in 2011, including 40 stores in Istanbul. Purchased by Roark Capital Group earlier this year, Wingstop saw sales in Q1 increase 2.5 percent over the same quarter last year, and it may have Super Bowl Sunday to thank. The company sold a record-setting 5 million wings on game day. National Football League legend and spokesman Troy Aikman joined the company’s board of directors in February and helped launch the Glider, Wingstop’s first chicken sandwich. The Texas-based brand is on the path to opening its 500th location this fall and is also set to add another 20 stores in Mexico over the next three years. The bakery chain has plans to open more than 20 units this year in markets as close as New York and far away as Bangalore, India. With nearly 15 new menu developments since last November—including a turkey, cranberry, and brie sandwich; a Greek salad; and five new cupcake flavors—and the launch of a refresh program, which features larger menuboards and updated furniture packages for its cafés, Au Bon Pain wants to keep its regulars coming back for more. As a brand with only nine company-owned stores, Taco John’s continued to emphasize its franchise focus last September when it offered new franchisees waived royalty fees during their first year of operations. 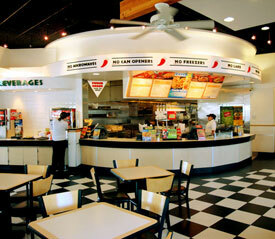 The taco joint ended the year with 418 franchise locations and saw average unit sales of $725,000 in 2010. It then turned its attention toward the digital world. Launching the “My Town Mania” initiative, an online loyalty program, Taco John’s has grown its mobile database by 1,746 percent. With health on its mind and menu—it was named one of Parents magazine’s 10 Best Chain Restaurants—Souplantation/Sweet Tomatoes pulled in $295 million from its 118 units in 2010. Perhaps the biggest change for the brand this year was the launch of its new bite-sized Souplantation Express, which opened its first location in January in Carlsbad, California. The company plans to open four additional Express locations, as well as eight of its buffet-style restaurants, over the next 12 months and is expanding its catering service in San Diego, Houston, Dallas, and North Carolina. franchise of his very own, but that’s not all the company was up to last year. The 187-unit chain launched its “Earth Fresh” initiative in March, which introduced products like unbleached recycled burrito wrapping paper and biodegradable plates, in an effort to steer the company toward sustainability.